Reviving past traditions, Kelley Hagemes is an artist flirting with the sublime. Working primarily in oil paint and graphite, she examines her world, visible and invisible, through allegory, symbolism. Using her own children, geometric shapes, halos, fleshy beings, patterns, various beasts and creatures, she is creating an otherworldly realm with its own set of emblems, mythology and superstitions. Hagemes incorporates a darker side of nature with a soft and subtle sensitivity, blurring the lines of what one perceives as beauty. "Stylistically I am most influenced by religious and mythical iconography. I was raised in a very religious Catholic family, surrounded by images of the Sublime, dripping with symbolism and encased in ornament. Such images are beautiful but also elicit a trace of fear and unease. I seek a similar effect through composition. This environment spurred an interest in theology and belief systems in which the lines of "real" and "mythical" are often blurred. It has evolved to an obsessive curiosity about all belief systems, ideologies, folklore, tall tales, eastern and western philosophy, alchemy, spirituality, occultism and traditions: Anything used to explain the origin of life, give meaning to it or alter the course of it. Carl Jung saw the human psyche as religious by nature. These elements add a "sacred" component to my art, especially recently, and has a direct influence in composition. I try to create an ethereal realm with its own language, emblems, mythology and inhabitants as an allegory for life as we experience it, the sensation of being, for dealing with demons and striving for salvation. In recent work I use disembodied floating creatures as harbingers of things to come. Other works include various beasts and creatures (or parts thereof) with symbols, as well as flora and fauna in the form of an altar or as an ode to saint prayer cards (which I still compulsively collect). Children are frequent subjects because of their raw courage despite their vulnerability as well as their connection to an innate knowledge we lose as we age. They are a symbol of strength in my work, they foretell and protect, hold a mirror to the world around them and are impenetrable by the implied dangers around them. I had my first child five years ago, and my second a year after that (oof). In that way my work draws on life experiences, telling a story. However, it is not my intent to make the viewer understand my experience but for it to connect to their own. I try to revive past traditions in order to examine my experiences and its intrinsic connection to others, to extend the reality of the visible world and perhaps portray a moment of speechlessness, a communication through symbolism. In a collection of interviews and writings of Alice Neel, she is quoted as saying, "Art is two things: a search for a road and a search for freedom." That statement resonates with me. The production of art is a personal exorcism ritual in which I seek to portray a part of life that extends beyond its own subjective limits, and gain a bit of understanding down the road and freedom in the process." 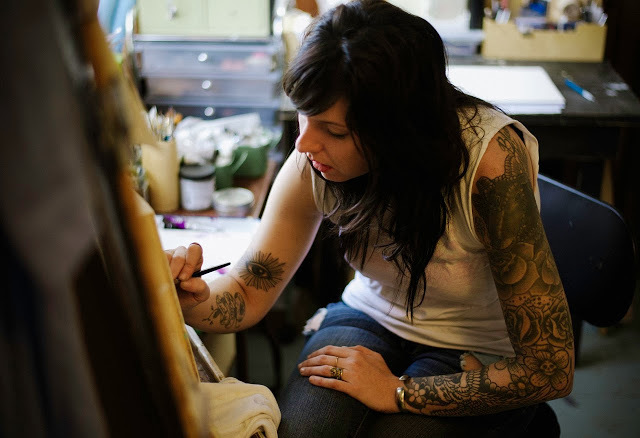 Kelley graduated with a BFA from the Hartford Art School and has since kept busy participating in gallery exhibitions, a residency at the School of Visual Arts in NYC, and has been featured in assorted publications including Beautiful/ Decay, You’re Welcome Savannah, and the Savannah Morning News. After years of restless meandering, she and her husband traded Brooklyn, NY for Savannah, GA where they raise their two children and work on various creative endeavors. She is currently pursuing her MFA at the Pennsylvania Academy of the Fine Arts.